The original Episcopal Church Center was built in 1953. The complex included an upstairs chapel, a downstairs student lounge, an efficiency apartment, and offices. 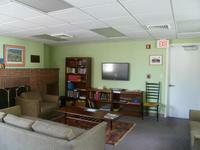 What was originally the student lounge is now the Infant Room of the UM/Canterbury Preschool. What was originally the upstairs chapel is now a library. The library is a cozy setting for Bible studies, meetings, watching movies, or just hanging out.